NDC is a program that supports the bottom-up transformation of air commerce. It opens an airline’s business, empowering them to seamlessly create, control, and deliver the most relevant offer across all channels, supported by compelling experiences and rich content. In short, it enables airlines to break free from legacy constraints to become customer-centric retailers. With NDC, customers can get their hands on great offers via any channel, either indirect (Agency, Travel Management Companies, Online Travel Agencies, Global Distribution Systems, or Metasearch) or direct (Web, Mobile, Kiosk, Contact Centre, etc.). At its foundation is a standard XML API that is managed by IATA. However, a successful NDC strategy is more involved than simply adopting an API. It’s a distribution program with a broad range of imperatives that include: strategy, offer innovation, organizational investment, performant-built technology, and the capability to support a global community of third parties. Like a game of ‘Snakes and Ladders’, there are wins and pitfalls. But ask any airline that is succeeding with NDC, and you’ll hear story after story of why it’s worth it. We know this because Farelogix has been leading the charge in the real-world application of NDC since its inception. Our customer base includes NDC pioneers Lufthansa Group, United Airlines, American Airlines, Emirates, Qantas, Qatar, WestJet, and Olympic/Aegean. By working alongside these front-runners, Farelogix has learned how airlines can climb the ladder of success while avoiding the various hazards along the way. To put it simply, we know what it takes to make NDC work in the real world of Travel Agencies, OTAs, Corporate Booking Tools, and even GDSs. We’re delighted to share our learnings with you in a series of blog posts. Beginning with this article that describes the first stage of your NDC journey – building a business case. We hope you enjoy the read! The industry is moving towards a wholesale adoption of the NDC messaging standard and we regularly meet with airline executives who are under increasing pressure to ‘do NDC’. For those just starting out, it’s important to note that an NDC program requires a well thought out strategy. Anyone running into NDC without such a strategy will likely run into trouble in terms of costs, fail cycles, and untapped opportunity. We suggest beginning with a 5-year business case that includes weighing the benefits against the costs, so your program is an investment that realizes returns. Included below are some benefits and costs to consider including in your business case. Ancillaries have made a significant positive impact on revenue and customer satisfaction for many airlines globally. However, all too often those gains are limited to the direct channel and remain underexploited in the indirect channel. In a simple example, if the direct channel represents 50% of the airline business, and an airline earns 20% of revenue from ancillary sales in its direct channel, the airline could potentially double its ancillary revenue opportunity by merchandising ancillaries in the indirect channel. For a Tier 2 airline generating $800 million in passenger revenue per year, that’s an additional $160 million annually of missed opportunity! Personalized offers, data-driven optimization, and dynamic pricing are trends that are revolutionizing the way airlines retail in direct channels. Research predicts that dynamic pricing could grow airline revenue by 6%. For a Tier 2 airline generating $800 million in passenger revenue per year, that’s an additional $48 million annually. Without NDC, this revenue opportunity will be excluded from the lucrative indirect channel. In the early days of NDC most airlines viewed NDC as a means of by-passing the GDS thereby saving on distribution costs. We still see some airlines pursuing this approach. However, for the majority of airlines, the end game of NDC is revenue gain and improved customer satisfaction, both through and around the GDS. The extent to which distribution cost savings drive the NDC business case will vary by airline, however in our experience, revenue gain is often the most powerful driver. Note: Building an NDC-standard API can be more involved than you might think. Market-specific requirements (e.g. installment plans for Brazil), ticket-stock, choice of pricing engine, and response times of third-party providers are all nuances that must be worked through. That can take time. By working with an experienced NDC program partner, the impact of these factors on the delivery time and cost can often be minimized and overall NDC program success maximized. You will need to have a well-structured NDC team in place to successfully scale your NDC strategy. Airlines advanced in NDC have invested in (and grown) teams of 30 – 60 people dedicated to this effort. This means restructuring and/or hiring, the design of new processes, training, documentation, and the adaption of internal systems (e.g. monitoring, settlement, and accounting). All of which comes with a required investment. 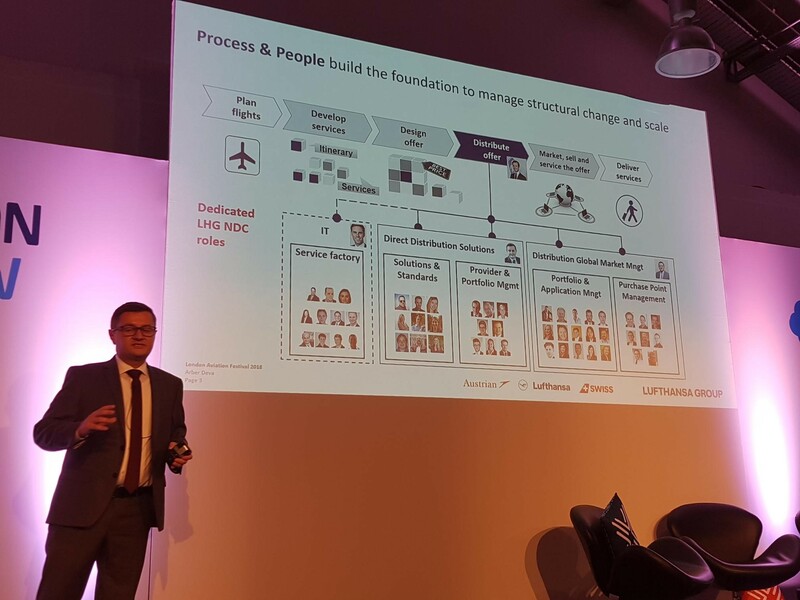 The image below features Senior Director, Head of Direct Distribution Solutions at Lufthansa Group, Arber Deva presenting how Lufthansa has re-organized for NDC. There will also be other direct costs and related investment associated with running your NDC program. For example programs for agency and tech provider adoption, as well as marketing. It’s also important to consider the competitive threat if you don’t act. With airlines putting NDC-enabled distribution and new content delivery at the heart of their commerce strategy, it won’t be long before your competitors are selling more through the profitable indirect channel. Targeted offers and rich-media (photos and videos) that showcase the value of the offer will all work to grow competitors’ passenger numbers and ancillary revenue. In an already ferociously competitive environment, consider the cost of not taking action and losing market share to an NDC adopter! As each airline has varying cost bases and business models, it is difficult for Farelogix to estimate the full return on any given NDC program. However, given the multi-million revenue growth opportunity and the positive impact on customer satisfaction outlined above, we are confident that the investment will be a fraction of the return. Stay tuned for our next article which will discuss three adoption strategies that you need to win with NDC!